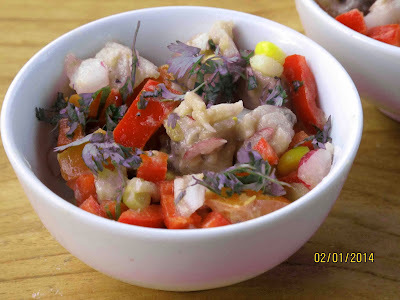 When the catch of the day turned out to be a kahawai I made some ceviche. It's hard to improve on raw fish salad soaked in coconut milk but for a change I used some Telegraph Hill wasabi vinaigrette instead. This smooth, Asian dressing with a peppery flavour really complimented the strongly flavoured kahawai. Marinate the fish in the juice of 2 lemons for at least 1 hour. Variation: Add some cubes of avocado just before serving.